AMD has gone live with their latest Never Settle Forever promotion as a part of their Gaming Evolved initiative. AMD’s Never Settle Forever promotion was hinted a while ago and has to be one of the most creative promotion ever done for a graphic card series. With Never Settle Forever, AMD Wants You To Choose the Games You Like! As always, the AMD Never Settle Forever promotion is exclusive to Radeon graphic cards. While the gaming promo adds no latest titles it does include some good new additions and it should be noted the way users would be able to redeem their games. The new titles added to the bundle include Dishonored, Syndicate and Alan Wake which were released in mid-2012. Titles such as Crysis 3, Tomb Raider, Far Cry 3 and Dirt games still exist and so do the other titles promotion still exist. 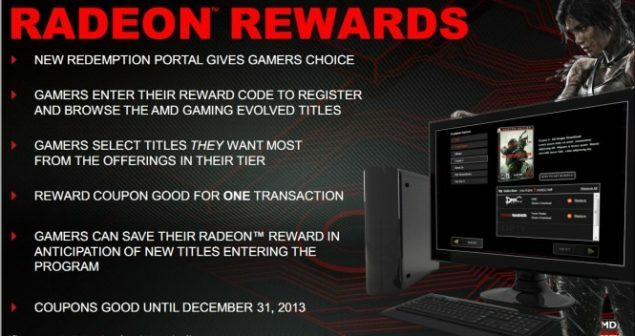 About the Never Settle Forever promotion itself, each Radeon card of a specific tier would grant users a reward. For Radeon HD 7700 series (HD 7790/ HD 7770), there would be a bronze reward which would let users choose a single title from a list 7 titles. 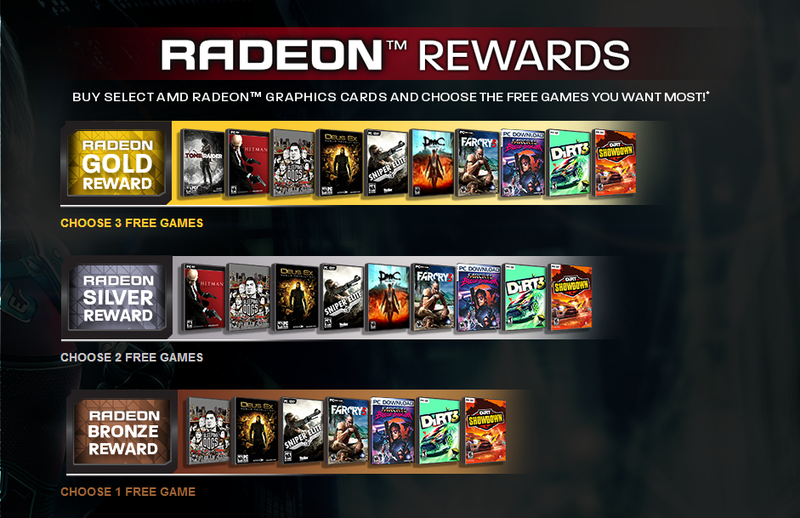 For Radeon HD 7800 series (HD 7870/ HD 7850/ HD 7870 XT) users would be given the Silver reward that would let them choose two games from a list of 9 titles. Lastly is the top tier Gold Award that’s granted upon purchase of an Radeon HD 7900 series (HD 7990/ HD 7970/ HD 7950) graphics card and can be redeemed for a selection of three games from a list of 10 titles. With the Radeon HD 7990, users can get upto 8 titles. Ain’t that sounds great? NEVER SETTLE FOREVER puts the power of choice in your hands. 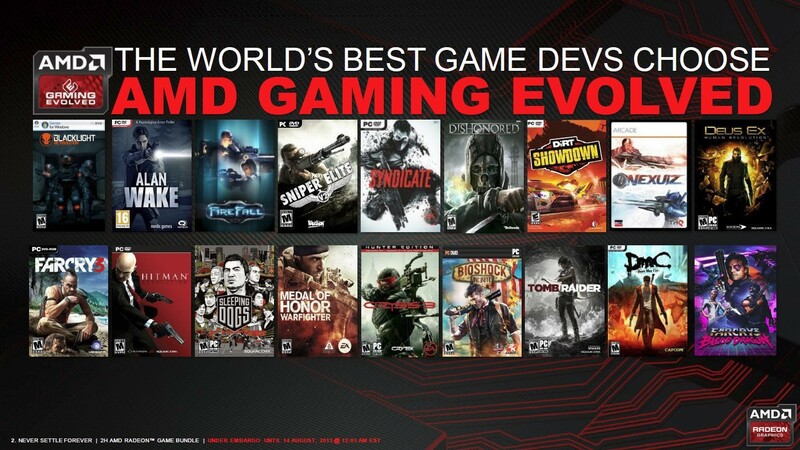 Choose the games you want most from a large selection of AMD Gaming Evolved titles. Redeem your code now for the games you see, or hold on to your AMD Radeon™ Reward coupon for upcoming games. When you see a game you can’t live without, redeem your coupon, choose your favorites, and let the games begin. But there’s more to it, you don’t have to select from the titles mentioned in the current bundle. AMD has also mentioned that users can hold on to their reward coupons and wait for new updates of upcoming games that they can redeem with the unused reward coupons once the game is launched or added to the AMD Never Settle Forever bundle. However, it would be AMD to decide whether what series of GPUs would the new game can be redeemable with or what Reward level would be required to avail the new titles. But it sure sounds good and makes it easier for those who have already got a specific title and now have the ability to select from a wide range of games. Aside from all this, its unfair to not point out that the value further enhances the value of AMD’s Radeon graphic cards. Now all we need to wait for is the Volcanic Islands based Hawaii GPU that’s arriving in Hawaii on 25th September!